This year(2015) Vinayagar Chaturthi comes on 17th September.That is in another 2 days. It is kozhukattai recipes everywhere in the blog world. This tempted me too. So I have decided to share some basic kozhukattai recipes for this Ganesh Chaturthi in the next 2 days, that can be easily made using rice flour. The recipe I am sharing today is sweeter version of Pidi Kozhukattai that is made with Jaggery, grated coconut and powdered cardamom. As I prepared it just to post in the blog, I made only few and my kids liked it so much that they ate all and complained that I hadn't made enough for them. 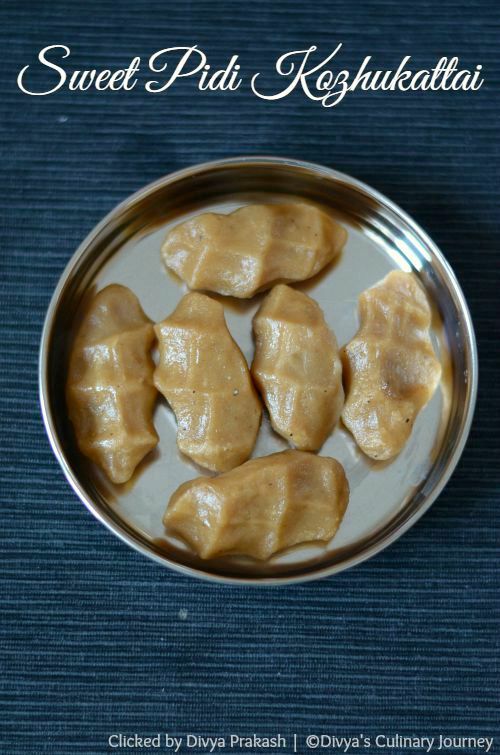 I have promised them that I will make these sweet kozhukattai's again for Vinayagar Chaturthi. Since it was evening, there wasn't much light and also I couldn't keep the kids waiting, so clicked just few pictures. May be will update with better pictures later. How to make Sweet Pidi Kozhukattai? Powder cardamom with a tablespoon of sugar and keep it ready. 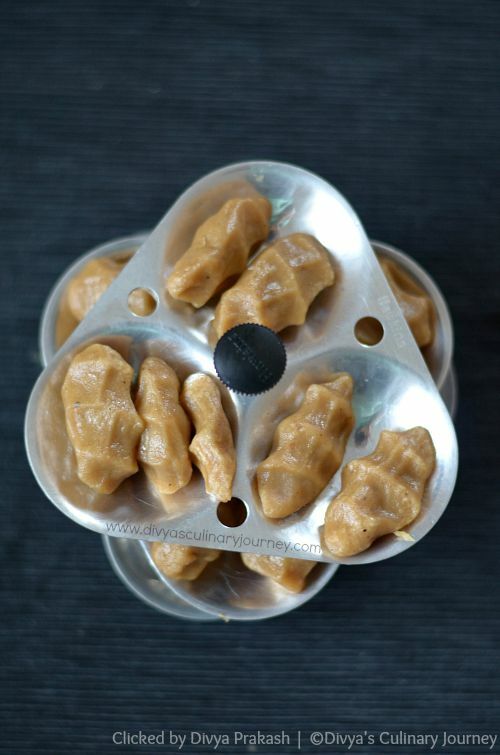 Grate the jaggery and add it to a sauce pan along with 1/4 cup of water and melt it. Filter this and add it to a heavy bottomed wide pan. To this add another cup of water and bring it boil. As it starts boiling, add grated coconut along with powdered cardamom and mix well. To this add a tablespoon of ghee. Now reduce the heat to low, and start adding rice flour little by little and keep mixing. After you have added all the flour, continue to stir till the flour mixture thickens up to required consistency (almost chappathi dough consistency). Turn off the heat. Let the mixture cool a little, just comfortable enough to touch it with hands. Keep it covered till then. It shouldn't be completely cooled though. Grease your hands with oil, take dough in hand , close the hand and press it with fingers to make kozhukattai shape.Repeat this for the rest of the dough. Arrange them in steamer/ idly plate and steam cook it for 8- 10 minutes till its cooked and turns shiny. But take care not to overcook it. I made about 12 Kozhukattai's. But this depends on the size of kozhukattai you make. I used store bought rice flour, you can use homemade rice flour too. The amount of water required will depend on the quality of rice flour. The color of the kozhukattai depends on the Jaggery you use. To check if you have attained the right consistency of dough before turning off the heat, you can grease your hand with oil and roll it with fingers, you should be able to get a clean ball with out being sticky. If after turning off you find that the consistency is not right, don't panic. It can be rectified. If it is dry, keep warm water handy, sprinkle them and knead till you get a proper dough. If the dough is too sticky, add some rice flour and knead. Add little by little and knead till the dough is of right consistency. Thangam tried at home and it came out very tasty !! !